Declan, Tobin. " 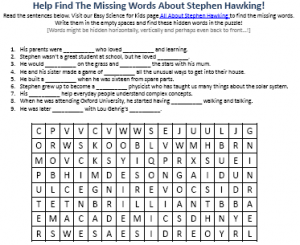 Stephen Hawking Biography Activity Sheet - Best Fun Science Kids Activity Sheet Printables - ." Easy Science for Kids, Apr 2019. Web. 21 Apr 2019. < https://easyscienceforkids.com/stephen-hawking-biography-activity-sheet-best-fun-science-kids-activity-sheet-printables/ >.